Few adults would ever utter such a prayer, but many betray a similar attitude with their actions. They seem to be content with their current state. They see no need for further improvement. As far as they are concerned they don’t need to change. They are just fine the way they are. Oh, how we need to cultivate a holy dissatisfaction for the status quo in our lives! We need to have a hunger to become more like Jesus. We ought to be determined that we are always seeking a higher level of spirituality. We should never be satisfied with who we are. We should always be seeking ways to allow God to change us for the better. “Not that I have already obtained all this, or have already arrived at my goal, but I press on to take hold of that for which Christ Jesus took hold of me.”—Philippians 3:12. 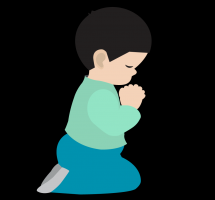 This entry was posted in Christian Living, Communion Meditations, Humor, Prayer and tagged becoming like Jesus, boy praying clip art, change, Philippians 3:12, spiritual growth, spiritual hunger. Bookmark the permalink.